With all of the snow storms that have covered the states for the past couple of weeks. The last thing on a lot of peoples minds is thinking about planting seeds for the Spring gardening season. For those of us who would like to get a jump on gardening before the real planting season starts. Breaking out the seed trays is a perfect way to do a little garden preparation in the winter months. 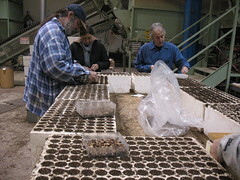 In horticulture, seed trays are used for propagating vegetables and flowers and other plants from seed. Seed trays are fine if you want large numbers of plants, or if you have plenty of seed and would like to save money growing plants instead of purchasing them at your local nursury. Most seed trays are sold in packages of three, and they measure 384mm x 244mm, which is the perfect size to hold most flower and vegetable seeds for planting. Using seed trays in the late winter months is an ideal way for cuttings or growing seeds until they are ready to plant out in early Spring. If you are like me I am sure that you have a few seed trays laying around in the garage or tool shed that are just waiting to be dusted of and prepared to plant some seeds for your next garden project.